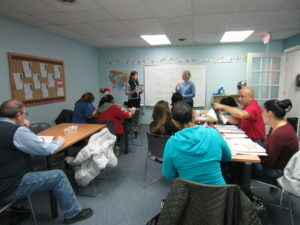 WATCH offers ESL instruction in group classes and with tutors, one-on-one. There are three levels of instruction in class - beginner, intermediate, and advanced. Students choose between two sections, Monday/Wednesday, or Tuesday/Thursday, and choose between morning (10:00am-12:00pm) or night (6:00-8:00pm), for a total of four hours a week. There are three class sessions during the year - Spring (January-May), Summer (June-August), and Fall (September-December). Students are registered and have their reading and writing tested their first week of class, and also choose learning goals for the session. Classes focus on teaching integrated skills of reading, writing, listening, and speaking, all with a focus on communication skills needed for daily life. If there is space, new students may join the class throughout the semester. Students can also study with tutors, one-on-one, according to their own schedules. Some students and tutors meet just to practice conversation, while others do lots of reading, grammar exercises, and homework. Students and tutors can meet here at WATCH, or at another location. There may be a wait to find a tutor, depending on students' needs and schedules. Students can be in class and studying with a tutor at the same time. WATCH also hosts informal conversation groups throughout the year, where students of any level can come to practice their English with other students and native speakers. 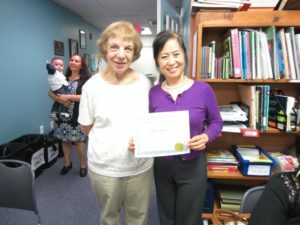 WATCH has also offered computer labs, writing clinics, and citizenship courses, which ESL students can get involved in.